The sides of this brass square are engraved with various markings. Inside its face are two horary quadrants, one for hours 'all'antica', represented by curved lines, the other with straight lines. The quadrants are calibrated for a latitude of 48? 15' (Vienna). 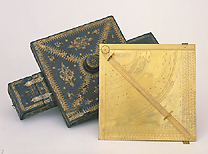 The same face of the instrument also bears the shadow square, used for making measurements of elevation, and an alidade which is provided with sights. The instrument is fixed to a stand. It can be dismantled and transported in its black leather case, which bears decorations in gold. The instrument, which is the work of the famous artisan Christoph Schissler, allowed the measurement of time and of terrestrial distances and heights. It belonged to the collection brought from Germany by Prince Mattias de' Medici in 1635.